Have you ever needed to call 911, but you didn't have a phone? Have you ever needed to run, but your legs were like spaghetti? Have you ever needed to yell "Help!" but your throat was dry with fear? For fun and extra credit write your story and put it in this file. 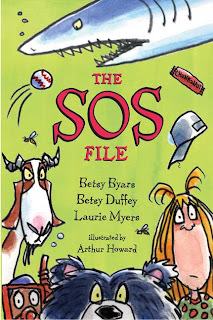 Twelve students take the plunge and submit their "SOS" experiences in the file, and each story is humorously illustrated and presented as a chapter in this delightful book. There's the story of the Pink Panther, a go-cart that runs amok as Liz screams in terror. There's "A Bear Tale," told by Augustus T. Breuwhiler III, who recounts how his life was saved from an angry bear by Abraham Lincoln. There's also a story involving summer camp, poison ivy and the spooky legend of the Pumpkin Man. 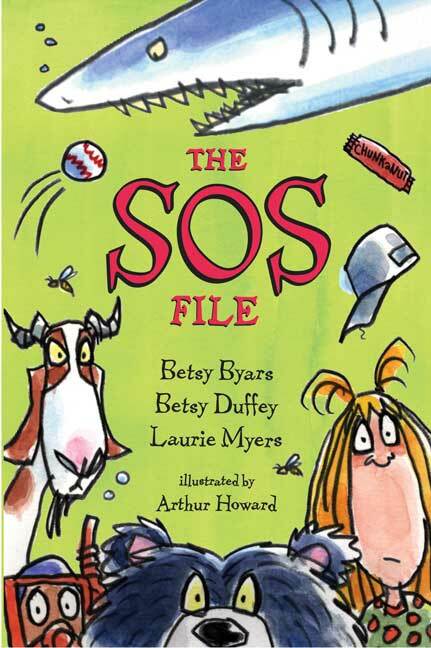 This is an entertaining and funny book that will keep readers engaged and laughing. The bold illustrations and large print, as well as the short-story format, make this one a perfect choice for readers who are transitioning from easy readers to chapter books. (For other recommended transitional books, click on the "transitional books" label at the bottom of this post or in the sidebar.) I think this book would also make a great read-aloud. I would have tried it out on my kids, but they ran off and read it on their own before I got the chance. It's definitely an all-around appealing book. sounds like a great bed time book!